The name Rococo for me conjures up images of sophisticated but slightly quirky chocolate luxury; a company steered by a woman who is thoroughly immersed in the world of fine chocolate. Chantal Coady is a name to be revered, she understands chocolate like few others. She is a chocolate pioneer and when she founded Rococo back in 1983, most of us in the UK had no idea what real chocolate was. Real Chocolate written by Chantal in 2003 was one of the first chocolate books I ever owned; reading the background and history of this most wonderful of substances, got me hooked (if it was possible to be even more hooked than I already was). Rococo have teamed up with the kitchen expert Magnet to make a number of exquisite chocolates in one of their kitchens and have produced videos to show us how it’s done. In this YouTube video, principal chocolatier Barry Johnson makes Passion Fruit and Rosemary Caramels in the Integra White range at the Magnet Kensington Showroom. It’s an eleven minute step by step guide showing how to produce elegant chocolates including essential techniques such as how to use a mould, make caramel and those all-important finishing touches that delight the eye. The flavours of passionfruit and rosemary had my mouth watering as soon as I heard about them. I adore passionfruit and when it is combined well with chocolate, it’s a real treat. The addition of the robust earthiness of rosemary is a great balancer to the fruity, tangy sweetness of the passionfruit. I had to have a go. As the video didn’t include quantities, I took an educated guess and the caramels worked out fine. I was only able to find one passionfruit, which wasn’t really enough, so I ended up with only eight caramels and some leftover tempered chocolate. For the 100g of dark chocolate couverture I used, a double quantity of the passionfruit and rosemary caramel would have been perfect, making sixteen large chocolates instead of only eight. Using a paintbrush, lightly dusted chocolate moulds with silvery gold glitter as I didn’t have the means for Barry’s method. Tempered 100g of Costa Rica origin 71% dark chocolate. Coated the sides and bottoms of 16 chocolate moulds (I was being hopeful and only had enough filling for 8). Left to set. Pressed the insides of 1 large passionfruit through a sieve into a small pan. Added 1 tsp of glucose syrup and a few needles of freshly picked and washed rosemary. Heated over a low temperature until warm, then left to infuse for an hour. Heated a heavy bottomed pan over a medium to high heat, then poured in 50g golden granulated sugar. Left to caramelise and turn a light reddish brown. Removed from the heat and stirred in the passionfruit, mixing vigorously as I did so. Added 15g of unsalted butter, followed by 25g of a good 41% milk chocolate and mixed until smooth. Left to cool, then spooned into the moulds, leaving a 2mm gap at the top. Left for a couple of hours to set. Topped the moulds with the liquid tempered chocolate and left to set. My chocolates may not have been as accomplished as Barry Johnson, but I was impressed with the results. The chocolate was tempered, with a good snap and a beautiful shine. In fact they were so shiny, they were virtually impossible to photograph. The chocolate was a high quality bar of Costa Rica origin 71% that I picked up at the Waterford Food Festival and it tasted delicious – rich and fruity but with no bitterness. The caramel was exquisite. It had a smooth soft texture and the flavours of sweet tart passionfruit, a hint or rosemary and rich chocolate melded perfectly. One of the points Barry mentions in the video is to be careful the caramel is well sealed by the chocolate as you don’t want it to leak out. I not only managed this, but also achieved a thin chocolate shell so the caramel was enhanced rather than overwhelmed. So if you’re planning on holding a dinner party or need something special to wow friends and family, why not try making these mouth-watering Passion Fruit & Rosemary Caramels. 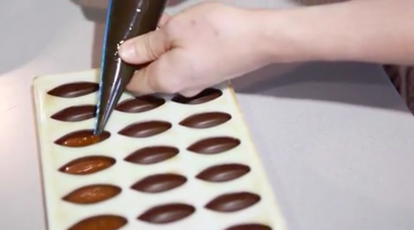 Even if you don’t, watch the video anyway – it’s so interesting to see the process and watch a top chocolatier at work in a clean and tidy kitchen. This is a sponsored post. I was not asked to write a positive review and as always any opinions expressed are my own. As these chocolates contain a caramel flavoured with fresh rosemary, I am entering them into Karen’s Cooking with Herbs over at Lavender and Lovage. Mediterranean herbs are this month’s theme. With rosemary being a Mediterranean herb, I am also sending this off as a posh Tea Time Treat to Janie over at The Hedgecombers and Karen over at Lavender and Lovage. Oh my goodness, I am so happy I found your blog! I am a complete chocolate cooking/baking fan and an amateur chocolatiere!!! I was looking for fruits to incorporate inside my chocolate cake, I might try a twist of this recipe 😉 mmmmhh now where is my secret stash of Friday 4.30pm chocolates…. That sounds and looks so good! I love to make my own candies! I haven’t done any in awhile. Thanks for the inspiration. Sounds like a winning combination. When do I get to try one? My gosh, this looks fab. Post me some please? what a brilliant post and WOW… how successful are your gorgeous chocs… i’m thinking you might be starting your own small empire soon? oh and i’m loving the rosemary, simply divine! Your tempering worked beautifully! So nice and shiny! Just look at that inviting, oozing caramel… I only have one question: how long did they last?! LOVELY entry for cooking with herbs and such a FABULOUS recipe for homemade choccies too – LOVE the photos Choclette! Fantastic looking chocolates, you really did well with them as I know it isn’t easy. I’m not sure if my wind up broadband will let me watch the vid but I’ll try. These look totally amazing Choclette. I am so impressed by your chocolate-making skills. The shine on those is mirror-like! The oozing caramel looks to die for! I love passionfruit so I am sure I would have loved these.I love the shine on them.I must learn how to temper chocolate properly. I saw these on Facebook but I had to come and have a proper look. They are amazing and I’m in awe of your chocolatier skills! Wow, you are rocking your chocolate skills lady! I honestly don’t think I have the patience to replicate these, but thoroughly enjoyed ‘watching’ you make them! These look like the nicest caramels ever. I want to try some right now! !